I have started on a new series of pieces. I think I’m in love. All the art stuff (read crap With No Useful Purpose) that I have been tearing apart, categorizing and holding on to, despite my husband’s what-the-hell-are-you-saving-that-for-expressions, is now coming in to its own in an exciting way. The back story: Friday I escaped the lair (read studio) for a few hours to meet my friend Linda C. and chew the art fat. We met at Barnes and Noble because they have a big old shelf of art books. I look at ten books and usually wind up buying one book or a magazine. Have you looked at magazines lately? Holy cow, magazines are seven or eight bucks, the same price as a paperback. I hate libraries, you have to give the books back. B/N gives me a table and serves Starbuck’s coffee which makes me a happy person-and I reward us both by spending my allowance on books. I found a fantastic book called, Who’s Your Dada, Redefining the Doll Through Mixed Media by Linda and Opie O’Brien. I’m telling you, the Holy Grail of art books for this kid. It even features a piece from one of the artists from Matter Gallery, the place that shows my repurposed work. How cool is that? I love looking at the concept of what a doll is and turning that on its end. What does it mean and why did it smack me between the eyes on so many fronts? How can it mean new things? 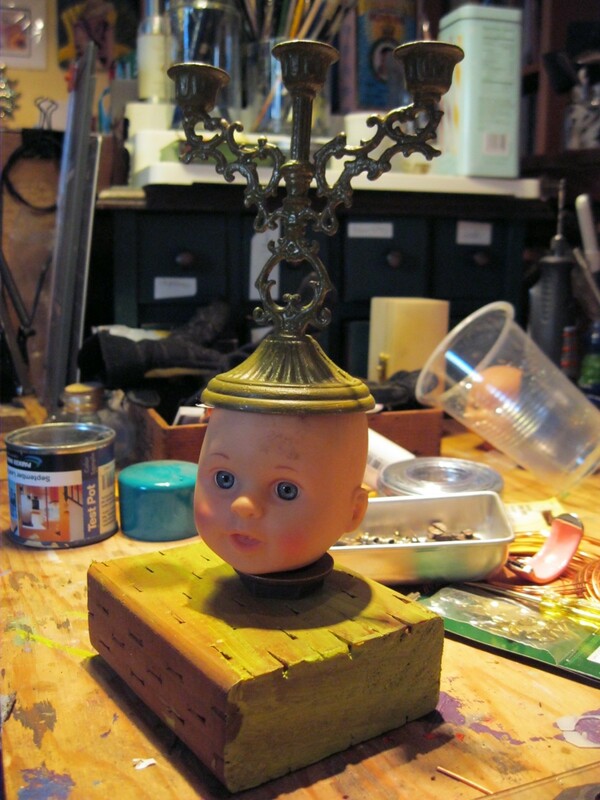 How can I use the idea of a doll to convey other information? Girls especially resonate to the idea of a doll. As little kids, this is an inanimate object we possess, carry around everywhere, love obsessively and refuse to be parted from, no matter how worn and grubby our dolls get. I think of my first doll and still get warm fuzzies. Why? Is it because this is the first thing that was all mine to love? Does the idea of love run downhill like water from our parents to us? I still have the stuffed rabbit doll that my dad gave me when I was four years old. 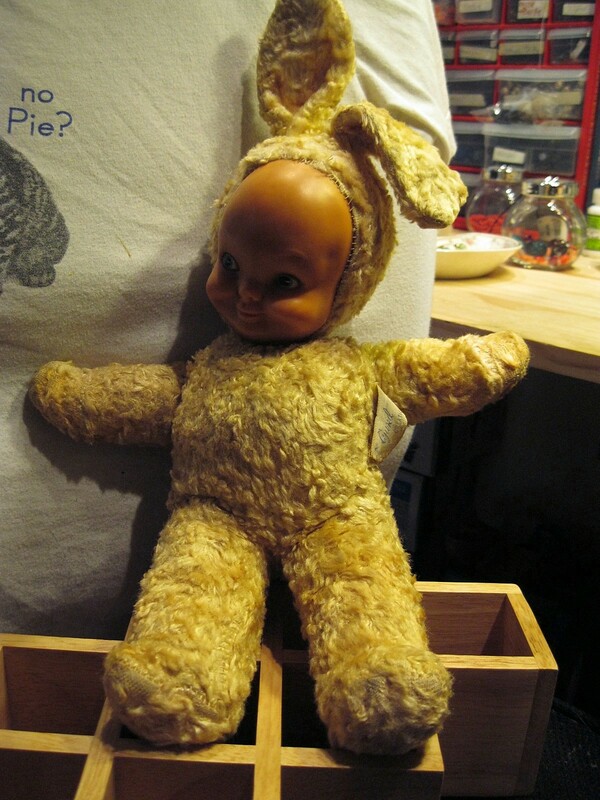 It has a creepy doll face and a yellow furry body and it used to have blond yarn bangs. Poor Rabbit was my go to friend and absorbed so much saltwater from my tears over the years I was growing up that its stuffing turned to dust. Rabbit has been restuffed and sits in a chair in my office, one of my totem objects. I have two ancient rabbits, which is a story for another day, but now you know where the original rabbit habit got its start. The other intriguing bit is using the “doll” to convey the idea of Dada, which I think was the precursor to going green and making wonderful new things with things that originally had a different purpose. Here is what About.com says in the art history section: Much more succinct than anything I could rumble up. ” What are the key characteristics of Dada art? Dada began in Zurich and became an international movement. Or non-movement, as it were.Dada had only one rule: Never follow any known rules. Dada was intended to provoke an emotional reaction from the viewer (typically shock or outrage). If its art failed to offend traditionalists, Dada writing – particularly Tristan Tzara’s manifestoes – proved a fine, nose-thumbing Plan B.
Dada art is nonsensical to the point of whimsy. Almost all of the people who created it were ferociously serious, though. There was no predominant medium in Dadaist art. All things from geometric tapestries to glass to plaster and wooden reliefs were fair game. It’s worth noting, though, that assemblage, collage, photomontage and the use of ready made objects all gained wide acceptance due to their use in Dada art. Dada self-destructed when it was in danger of becoming “acceptable”. http://arthistory.about.com/od/dada/ig/DadaatMoMANewYork/dada_newyork_07.htm This link shows a photo of a well known dada symbol. Marcel Duchamp’s Urinal which he put in a show and signed R. Mutt in 1917. Most dada art is not quite so in your face establishment! as the toilet was, but its deliberate use repurposing items out of context to convey ideas shocked the world at the time. It was a fascinating time, and the things the artists did/meant/stood for, are part of my own core values as an artist. This movement is worth tracking down for what it was and doing more reading. 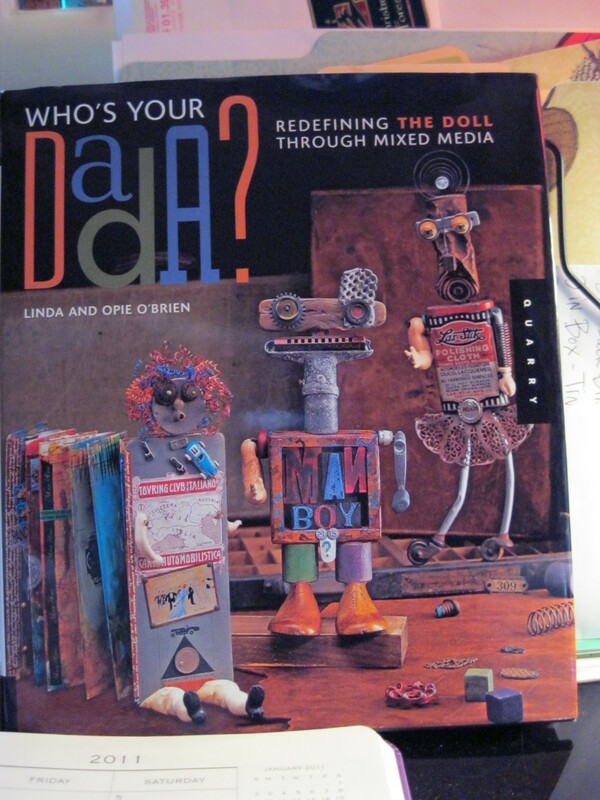 http://www.visual-arts-cork.com/history-of-art/dada.htm is an excellent place to start. Dada as a movement only lasted from 1916-1923 but it spread like a forest fire and went world-wide in that span of time. This entry was posted in Art is a tart, Rabbit's Makes Art, Uncategorized on February 2, 2011 by rox.